In most houses, the food debates center around what to have to dinner. In our house, though, it’s always about what to have for dessert. It’s always a debate – pie vs. cake, cookies vs. ice cream, etc. I love combo desserts because then we skip the debate! 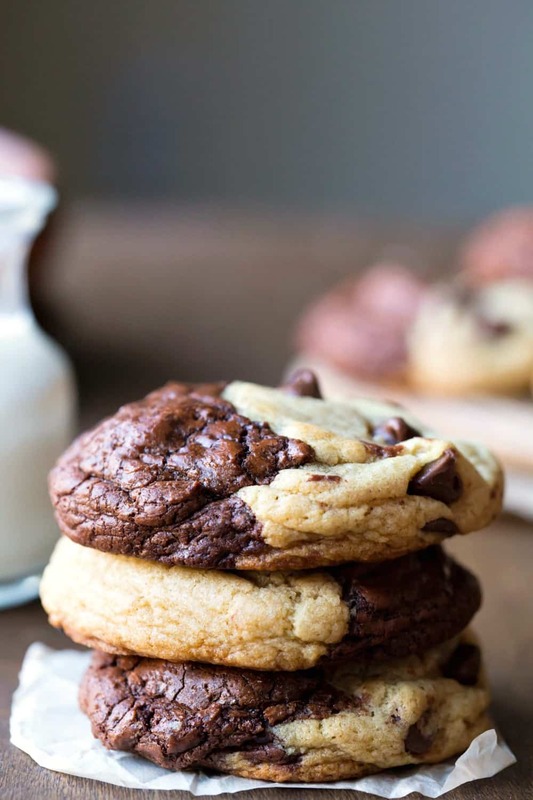 This Brookie recipe combines two of my favorite cookie dough recipes – Brownie Cookies and Chewy Brown Sugar Chocolate Chip Cookies – into one delicious super cookie. No debates or decisions necessary. If you’ve tried this brookie recipe, don’t forget to rate the recipe and leave me a comment below. I love to hear from people who’ve made my recipes! You can SUBSCRIBE to receive my latest recipe newsletters or FOLLOW ME on FACEBOOK, INSTAGRAM and PINTEREST for even more delicious food. 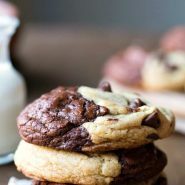 This Brookie Recipe combines buttery, chewy brown sugar chocolate chip cookies and rich, chocolaty brownie cookies in one cookie! Melt chocolate and butter in a heavy saucepan over low heat, stirring constantly until melted and well-combined. In the bowl of a stand mixer, beat the eggs, sugars, vanilla, baking powder, and salt on high speed 5 minutes, or until the batter is thick and creamy. Add chocolate chips. Stir in to combine. Cover the batter, and chill while you prepare the chocolate chip cookie dough. Pour melted butter over sugar. Stir to combine butter and sugar. Let stand 5 minutes. Cover, and chill for 30 minutes. Preheat oven to 350 F. Line 2 large baking sheets with parchment or silicone baking mats. Using a 1.5 tablespoon cookie scoop (medium), scoop up chocolate chip cookie dough. Repeat with separate scoop for brownie cookie dough (or clean scoop in between). Press the two doughs together, sealing the seam in the middle. Bake 9-12 minutes, or until done. just made these and they are DELISH. needed a bit more flour in the brownie mix than what the recipe says but no biggie, thanks for sharing. I also followed the brownie recipe exactly and mine came out like a brownie batter that was too soft to form into a ball. I added almost 1 cup more of flour and that helped make it become an actual cookie dough. About to put them in the oven, can’t wait to see how they turn out! Hey! I hope adding the flour helped! It should have been thick after you beat the egg and sugar together. Was it thick at that point? The browine portion should be thick and easy to work with. Was that how it was? oh my, I just has one from the first batch. SO AMAZING! Can this be made ahead of time and put in the freezer? I have seen cookie dough put in the freezer but not brownies. Trying to prep them for thanksgiving. I haven’t tried to freeze this dough, so I’m afraid that I can’t help much with this. I’m sorry that I don’t have a better answer for you! I’ve been craving these for a while. Taste sooooo good!!! In the directions for the brownie dough…you mention adding in salt but no salt is listed in the recipe. I looked at your brownie cookie recipe and that lists 1/2 tsp salt so I’m going to add that to this recipe. LOL…hope that is correct amount? Currently making them now. Can’t wait to taste! Yes, that’s the correct amount. Thank you! I’ve fixed that on the recipe. The cookies were more work then making chocolate chip cookies but SO worth it!! Made these cookies for my friends birthday and everyone raved about them. Thanks for the recipe! Yay! I’m glad the cookies were a hit! Yes, since you’re making two doughs, they are a bit more work. Thanks for taking the time to come back and leave a comment! I have to try this!! Thank you. The kids love them. Hope you do too! My cookie dough was super dry! What do you recommend for that? When I end up with dry cookie dough, it’s almost always because there was too much flour in the dough. I fluff up my flour before I measure it, and then I lightly scoop it. I’ve found that fluffing it up helps in case the flour has gotten packed down. You could also try decreasing the amount of flour slightly to see whether that works. Hope that helps! Absolutely! 1) I don’t. I use a cookie scoop that releases round mounds, and I leave them as-is. I find that most doughs spread enough that I don’t need to flatten the dough. Also, I like my cookies to be a little thicker, but that’s a matter of personal preference. 2) I gently press the two doughs together, and then I just run my finger over the seam to seal it. Then I re-shape the dough as needed. You won’t want to roll it because it can make the dough warm, which will lead to spreading. Best of both worlds!! Recipe sounds amazing! !